I truly enjoy photography, especially nature scapes. This is mainly due to my love of hiking and "National Geographic". Being outdoors a great deal also puts me in great locations to take some nice pics. I want to share these with you here, so what I've decided to do is post a weekly picture, my favorite at that time shall we say. I hope you like them. I will include the title and a brief description of each one. Feel free to let me know what you think. 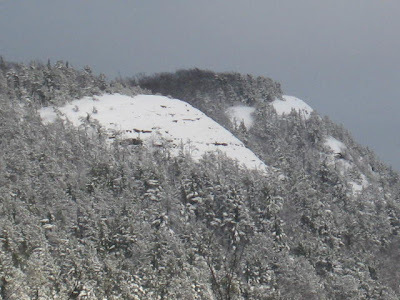 This weeks pic is "A Wintery Bluff" and it was taken shortly after a light snowfall. The Bluff is one of my favorite places for day hiking, no matter the time of year. On this day though I was simply visiting my folks and playing with my son in the backyard. The grays in this pic are inspiring and illustrate in color how color is not always needed to make a great picture. The pic and the time with my son made for a great day.